I'm no stranger to a brownie. Other than freshly baked bread, homemade brownies must be up there in the top five of best household aromas which make a house a home. Plus they taste damn good too. When asked if I wanted to review Pulsin's newly re-branded range of brownies, it was a pretty easy decision, let's be honest here. 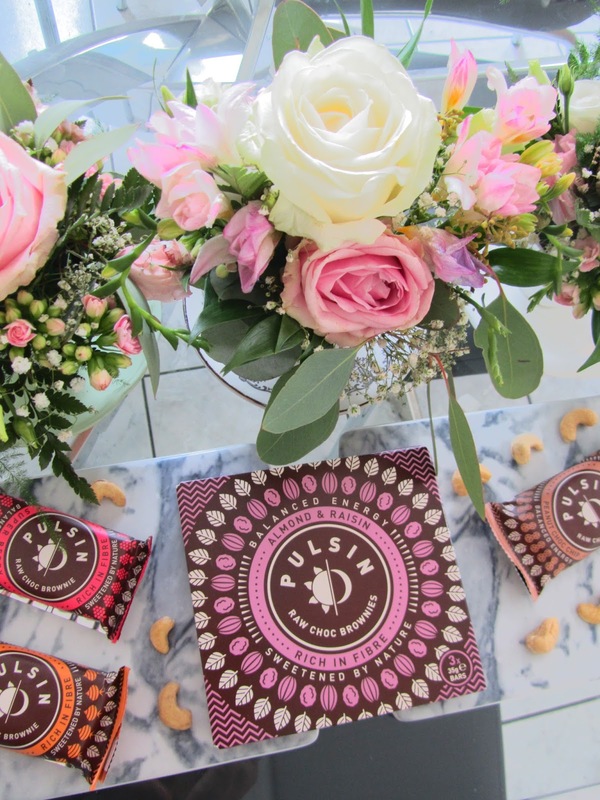 For those unfamiliar with Pulsin, Pulsin offers a range of healthy snacks which focus on wellbeing as well as taste, providing a healthy way to maintain your energy levels across the day. With listed ingredients such as dates, green tea extract and grape juice, I was intrigued to see what a healthier version of one of my favourite treats would taste like. I was a little nervous about this one as I hate peanut butter. As luck may have it, this brownie contained actual peanuts rather than the butter - so a thumbs up from me! This was the very first brownie I tried. Based on first appearances, it looked like your typical gooey brownie, but when you bit into it, it was a drier, more crumblier texture than I was expecting. The brownie itself wasn't very chocolately but it's saving grace were the peanuts which gave it some taste. As M very eloquently put; "it tastes healthy". 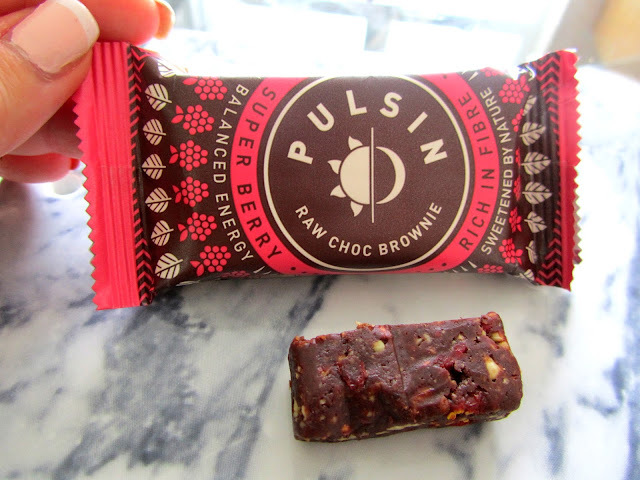 The main defining factor of this brownie was its pinky red hue, due to the inclusion of goji berries and raspberries. The brownie itself didn't smell particularly berry-esque, but it did smell like raisins which was curious considering that raisins weren't listed in the ingredients! I found this brownie a little too sweet for my liking (probably as it contained berries, grape juice AND dates) and my only criticism was that I could strongly taste the dates but didn't really get any sort of berry flavour. To improve the recipe, I would add some larger cut cashews (another one of the ingredients listed here!) to soften the sweetness and add another texture. 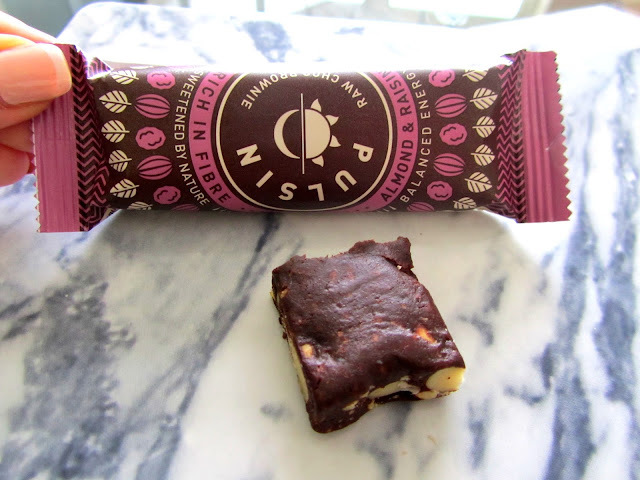 Compared to the super sweetness of the berry brownie, the maca brownie was a plainer affair. Contrary to my initial thought process, "maca" doesn't refer to macadamia nuts - Maca is in fact a Peruvian root herb which has been used for centuries to release stress. A brownie that helps with stress? Definitely my kind of product! 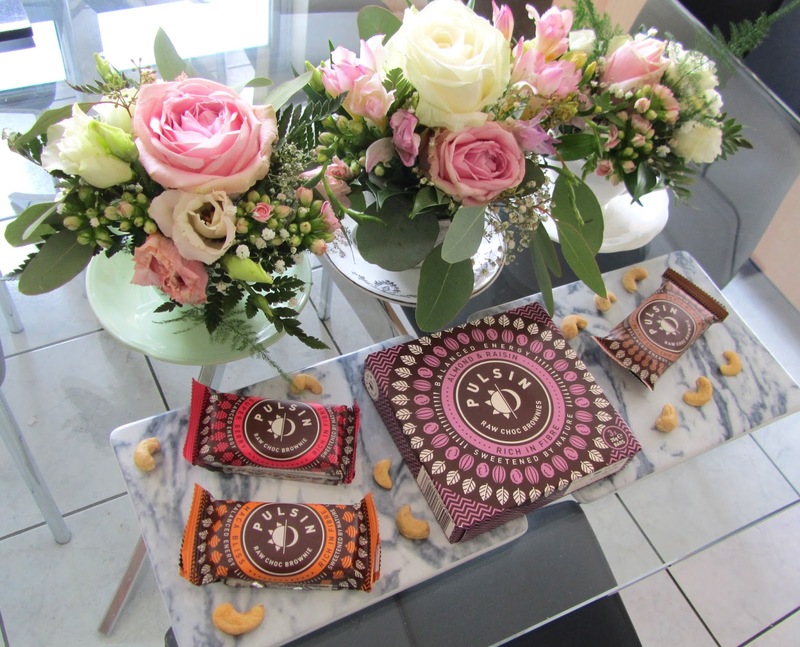 Almond & Raisin - the raisin taste was nicer than the dates, and the bigger nuts worked better! Maca Bliss - fairly plain and inoffensive - better for those who want something less sweet! If nuts are the main focus of the brownie, include larger chunks and enough of it! None of the brownies I tried tasted vaguely chocolately so maybe explore the chocolate balance? In summary, I really enjoyed trying a healthier version of brownies. 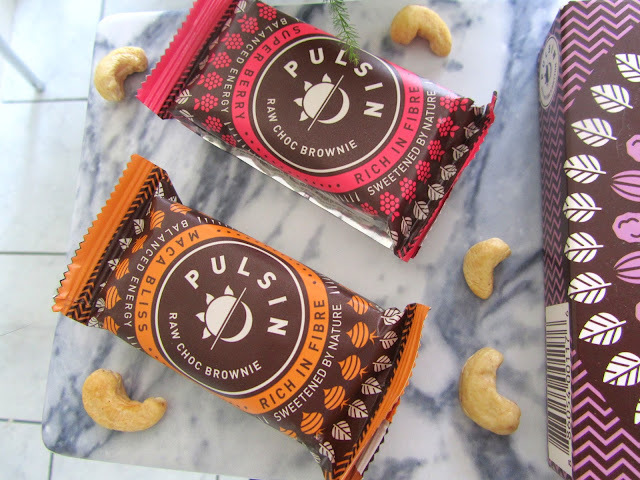 Whilst I won't be giving up the full fat version any time soon, I would definitely buy the Pulsin Almond & Raisin brownie and the Pulsin Peanut brownie again in the future. These two weren't too sweet and felt very substantial. 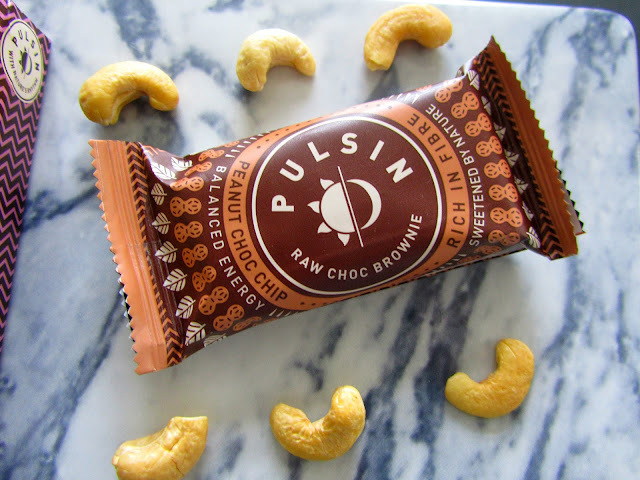 They would be perfect as a late morning snack at work to keep your energy levels up for the day, or pre gym workout to give you a boost. 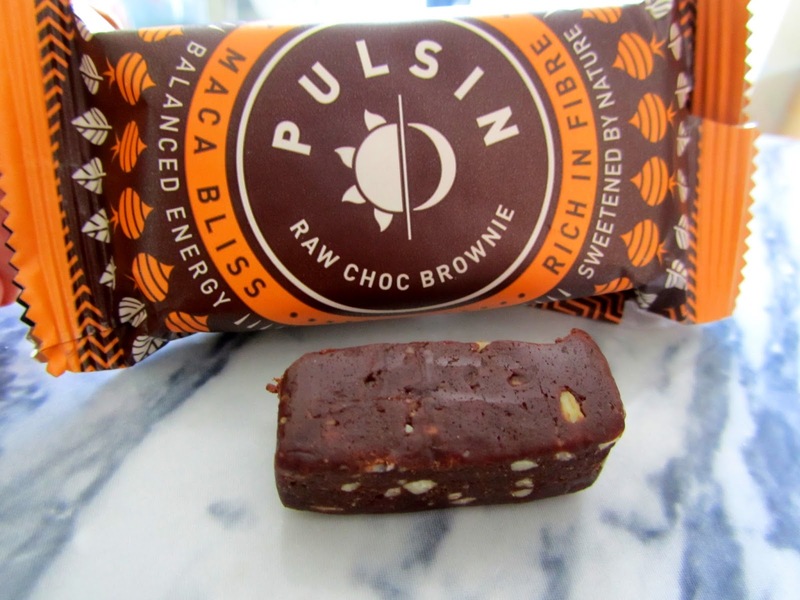 Would you give healthy brownies a go?